Happy Birthday to the Roundup. I’m sure you already read, right? Well, if you don’t, it’s not too late to start. Read, enjoy, comment. Yes, they’re homemade. Lemon-blackberry buttermilk cake with a lemon cream filling, and a blackberry buttercream. ~ by Larisa on August 6, 2010. OMG. Those look delicious! I love the berries on top. Are the two on the sides sugared berries? oh so yummy looking. Yes, sugared berries on the two side cupcakes. Nice job Mrs. Hope. The frosting job is beautiful! They look yummy, and complicated! Wow, those look AMAZING!!! Would you consider sharing the recipe? 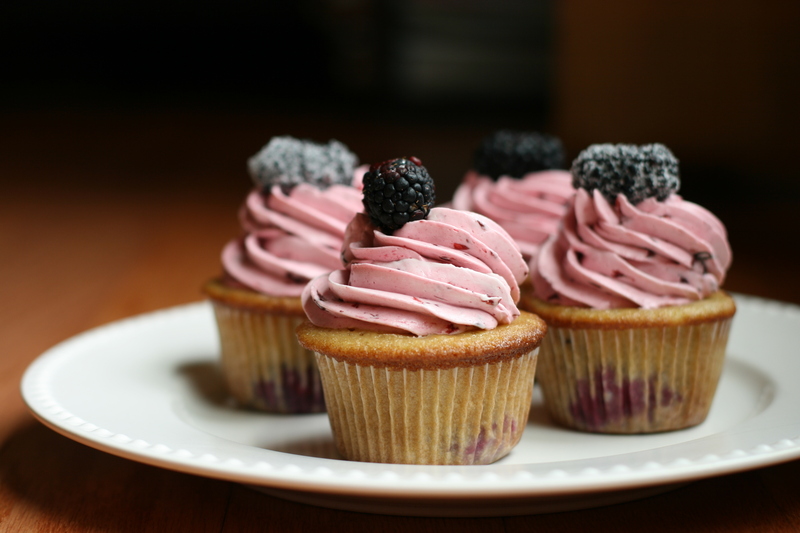 I love cupcakes and with all the fresh blackberries right now, would love to try my hand at making your masterpiece. So pretty and so delicious looking! You must be very talented! I agree with the assessment – so gorgeous and yummy looking! I also would love the recipe if you would be willing to share. . . I am admiring you and sending support on your journey right now. and your daughter is so cute.